You might not need to store your documents for 1000 years, but people that do came to Keynote Photonics for the electronics. Since 2008, a frozen mountain near the North Pole has been the home of the Global Seed Vault. 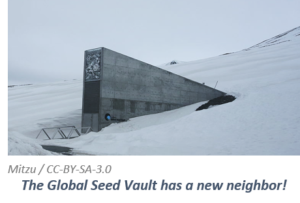 The Vault is a facility dedicated to preserving millions of seed crops from around the world. Stored on the Norwegian island of Spitsbergenare, the seeds are preserved in foil packages, close to the North Pole and safe from any natural or man-made crises. And now, the Seed Vault has a new neighbor, the Arctic World Archive. The Archive has a similar vault but instead of storing seeds, the vault is an information repository. Located far from any human conflicts or environmental dangers, countries are already starting to use the vault. They are storing copies of their most important historical documents using a DLP® exposure system developed in part by Keynote Photonics. Founded by the Piql (a Norwegian company), the archiving process starts with digital copies of the documents or images. Since digital storage devices have a limited lifetime, Piql uses advanced electronic and optical systems to store the data on their unique film technology. This film can retain data for hundreds of years. Transferring this huge amount of data onto the film using high-density QR codes required a state-of-the-art projection system. So, in 2012, Piql chose Keynote Photonics to develop the electronics that made that system possible. 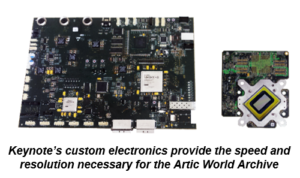 Using Texas Instruments Digital Light Processing technology, Keynote Photonics developed custom drive electronics using TI’s highest resolution digital micro-mirror device (DMD). The archive system first sends the data to Keynote’s drive electronics. The electronics format the data to properly display the QR code on the DMD. Using over 8 million microscopic mirrors, Keynote’s electronics then exposes the Piql film with incredible precision and phenomenal speed. Although the DMD is the same as used in state-of-the-art digital cinemas around the world, we have adapted it to display binary bits of data on the film. It’s ironic that the technology that has replaced film projectors in the cinema is now being used with film to protect and store the worlds’ intellectual treasures. Create your own custom solution! 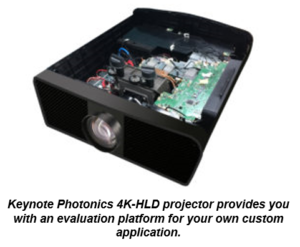 Keynote Photonics is an authorized provider of custom DLP electronics and projection systems. Our systems are helping customers develop a variety of solutions for high-resolution display, 3D scanning, 3D printing, and UV exposure. Keynote’s latest product is a 4K-HLD projector. Using 4 times the resolution of today’s high definition standard, the 4K-HLD projector can display vibrant images covering the entire DCI-P3 color gamut. But it can also be modified with a single high-power blue LED for high-precision scanning applications. And it can use UV illumination and modified optics to enable large-platform 3D printing. Please contact us for help with your custom application or production needs.